Welcome to the GMAT reading comprehension lessons. In this intro lesson, we're gonna start off with a passage that is not a GMAT passage. The reason is, it's important to understand what a GMAT passage is, how it is structured, how the information is laid out so that you can not simply try to digest everything in the passage but remember the information that is most important. But first, something that is not a GMAT passage. Let's take a look here. If you read, we learn about women working while men are gone in World War II, and about those women returning from those jobs, returning to the home once the men come back from the war. And then, what happens? Well, there's a dramatic surge in population. This is known as the Baby Boomers. The end. Nice little story. But, it's not a GMAT passage. It's not that the topic wouldn't show up on the GMAT, it's the organization of the information. See, this is very factual. It just wants to inform you about a phenomenon, women working while men were away in World War II and what happened after men returned. Nobody is taking a position on an issue or a debate, simply because there is no debate. That, of course, is not to say that a GMAT passage won't have a quick intro to whatever topic it's discussing. But very quickly, the author will show that there is debate, an issue of contention going on. So, with that said, let's take a look at an actual GMAT style passage. Sure, we begin here with the introduction. What's going on? Well, men are returning from the battlefield after World War II, and women are going back to the home. But right away, we see that the sentence here says the dramatic increase in birth rate is perhaps not too surprising. That's already an opinion. And then, we get this word here. Yet, such factors alone cannot explain the increase in the number of births, and then, we suddenly have a name. Someone is suggesting something, giving us a theory. How is it that there were so many births after World War II? And then, another person comes along here with their theory. And if that's not enough, we finally have the second paragraph, where, yet, another person says, hey, both those you've mentioned in the previous paragraph are lacking. Here's what I think. So that is very complex, but that is pretty standard for the GMAT. Now it is true that this may, be a little bit more complex in terms of the multiple theories offered, because it is a short passage, that is. And if we go here, we can see that it continues on, it's about 200 to 250 words. The GMAT will be made up of these short passages as well as median passage, which are over 300, 350, and then, a long passages which can go over 400, and as many as 450 words. 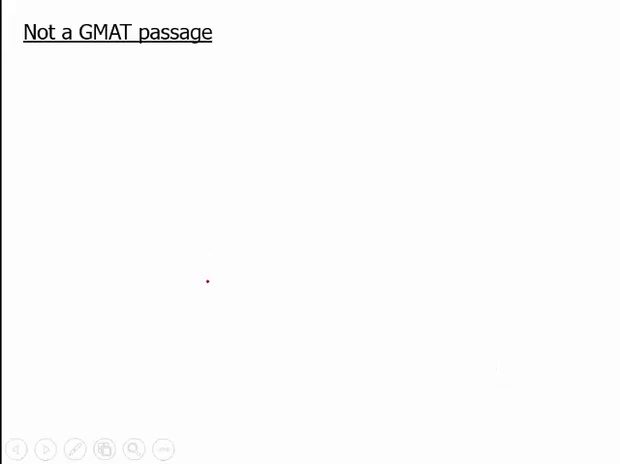 Of course, those are all basic details that really aren't important to how you approach the passage, because all GMAT passages have these basic ingredients. What are these ingredients? Well, we've already touched on one of them. Multiple theories. As we saw in that passage, there was someone named Murray. There was somebody named Kimbell. Both of them were taking a position on the issue of why there were so many babies, so many children born in the years directly after World War II. Notice, of course, there's another person, Carsten, involved. The point is, this is what you'll see on the GMAT passage. Typically, the multiple theories will be more common on the longer passages but you will see them as well on the shorter passage. And, of course, shorter passages will always have at least one theory, whether it's the author's or someone else's theory. And typically, the author will give an opinion on that theory. What else can we expect though besides a flurry of theories? Well, people aren't just gonna mention their theories without giving us any support, and so therefore, there is always support to what this being said. Notice here we have, "For instance, large numbers of women who started families after 1945 continued working at factory jobs." This backs up Carsten's view. Of course, not important, because we're not actually answering questions about this passage right now. But we can see that evidence is an important part of the passage and a very important part of questions because when you want to support your answer choice you must always go back to the passage and find that supporting evidence. What else can we expect on the GMAT passage? Well, the person writing it is writing it for a reason, and this is huge. The author isn't just writing it, or the GMAT people aren't just giving you a little excerpt or something. The passage clearly has an intention. It wants to communicate something. And this thing is called the Primary Purpose. It is also a very common question type and accompanies almost every single passage that you will see on the GMAT. In other words, the question will be, the primary purpose of the passage is to do which of the following? For now, though, know that it is a primary ingredient. And, so, therefore, when you read the passage, it is something that you should be looking for, something that you should anticipate. And so, when you are done reading the passage, you can actually turn away from the screen, not look back at the words and say to yourself, the reason the author wrote the passage is to x, y, and z. And that is definitely very helpful strategy when dealing with these passages, knowing what the primary purpose is in your own words. And finally, or not finally, but one other important ingredient is structure words. Structure words such as contrast words. Intensifying words are words you see throughout these passages. Notice the beginning, and we're gonna come back here, we're gonna go over the illustrative words and cause words. And, I don't want you to become flustered. The reason is, we're gonna be coming back to a lot of these parts, these ingredients in subsequent videos. What I want to show you now is not necessarily memorize these as effect words, thought that would be helpful if you want the pause the video, but to see how that actually plays out in a passage. And so what I've done is, I've taken these structure words, yet, because, however. And the key here is, what is the function of these structure words? These words are to show the relationship between sentences, and even times, relationships within sentences between the clauses. Finally, these structure words show us the relationship between paragraph by paying attention to these words we can say, ha. There is a shift here. A change in direction because of the word, yet, however, or in the case of because over here, a reason is being provided. By noticing these shifts, you will be unable to understand the flows of the sentences. And that is key, because otherwise, it's very easy to read these passages and simply string sentence after sentence without noticing these vital structure words. Now, as I said, I will return to structure words in more detail in the following videos. I will also go through primary purpose and break down many of these main ingredients so that you will know how to read the GMAT passage. And not just read it passively, but actually, intelligently categorized information because this information, as this passage shows, is typically in a predictable pattern. And once your brain can pick up on that pattern organize that information, it's going to become a lot easier answering the questions.